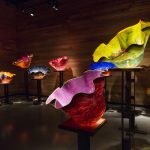 The CHIHULY COLLECTION is a stunning, permanent collection of world-renowned artist Dale Chihuly’s unique artwork. This presentation is unique as it is the first installation of Chihuly art in a building designed specifically for that purpose. Designed so that the art and architecture work together to create a visitor experience unlike any other exhibition of Chihuly’s art. The Collection is marked at the entrance by an iconic 20-foot sculpture created especially for the site. The Collection includes Chihuly’s spectacular large-scale installations such as Ruby Red Icicle Chandelier created specifically for the Collection along with several popular series works including Macchia, Ikebana, Niijima Floats, Persians and Tumbleweeds, which have thrilled audiences around the globe. Each space has been designed individually to complement each installation producing unique visual experiences. Please call or stop by the Chihuly Collection Store for pricing and availability. 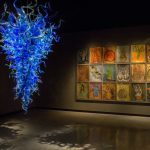 A pioneer of the studio glass movement, Chihuly is credited with transforming the methods of creating glass art and thereby leading the development of complex, multi-part glass sculptures and environmental art. However, his contributions extend well beyond the boundaries of the studio glass movement and even the field of glass: his achievements have influenced contemporary art in general. 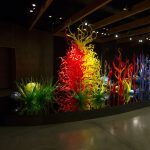 Over the years the artist has created a number of memorable installations including “Chihuly Over Venice” with the sculptures installed over the canals and piazze; "Chihuly in the Light of Jerusalem”, attended by more than one million visitors, and the “Chihuly Bridge of Glass” in Tacoma, Washington. For more information please visit Chihuly.com. If you are interested in becoming a docent, please click here for more information and a downloadable application. 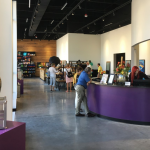 You can enrich your experience further by visiting the Morean Glass Studio where you can watch glassblowers create one-of-a-kind pieces, have your own personal glass blowing experience and shop for unique glass art created by local and regional artists. The Glass Studio is located conveniently behind the main Morean Arts Center facility located at 719 Central Avenue. See the best of Tampa Bay.